December 2, 2014 k3fitLeave a Comment on December Newsletter: Like Every Other Month! December Newsletter: Like Every Other Month! It’s here!!! While December can be a very demanding month in so many ways I challenge you to treat December 2014 like any other month of the year as far as working out and eating clean. Why? During the holiday season this is the time when we need to be there physically and mentally for others and if we cannot take care of our own health, how can we really be there for others? If working out and eating clean consistently already then why would you not continue that consistently? 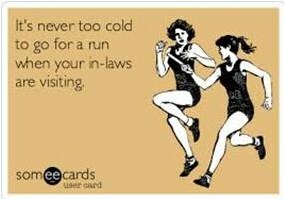 The good news is you can stay in shape and even get in shape during the holidays!! STAY CONSISTENT– Stick with you schedule as if it is a personal appointment to yourself. You will come up with lots of reasons to not workout but in reality there are far more reasons to workout. DO NOT GO HUNGRY- Do not go to a holiday party hungry. Eat more fruit/vegetables high fiber foods before heading out. I typically eat before events like this if I do not know what kind of food will be there. I also bring my own food or I will bring a healthy dish to share for everyone. Do not be afraid of offending someone or feel the need to eat certain things because at the end of the day its about you and your goals. FITNESS YOU CAN LIVE WITH gift certificate! Now let’s talk a recipe! 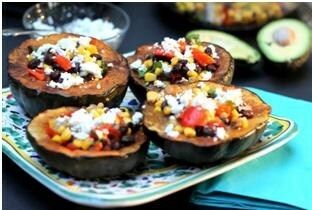 Take the chill off of winter with this Mexican style stuffed acorn squash. Preheat oven to 400°F. Spray baking sheet with cooking spray. Cut both squash in half horizontally and scoop out seeds. Place the squash cut-side down on the prepared baking sheet. Bake for 45 minutes or until squash is very soft and tender and edges begin to brown a bit. Turn oven off and leave squash in the oven while preparing filling. Lightly heat a large skillet over medium heat. Add olive oil, red pepper, onion, garlic, jalapeno; cook until softened about 3 minutes. Add in cumin, black beans and corn; stir well to combine and cook a couple more minutes. Remove from heat, stir in cilantro and lime juice in. Add salt and pepper to taste. Fill the squash halves with black bean and corn mixture. Top each with a tablespoon of goat cheese. Next Music Brings the Beat, I mean Heat Up!